Egg specialties lasagna. 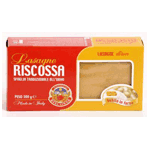 The eggs pasta is much more nutritious and tasty and it's perfect if used with the right dressings such as red and white sauces. Product of Italy.